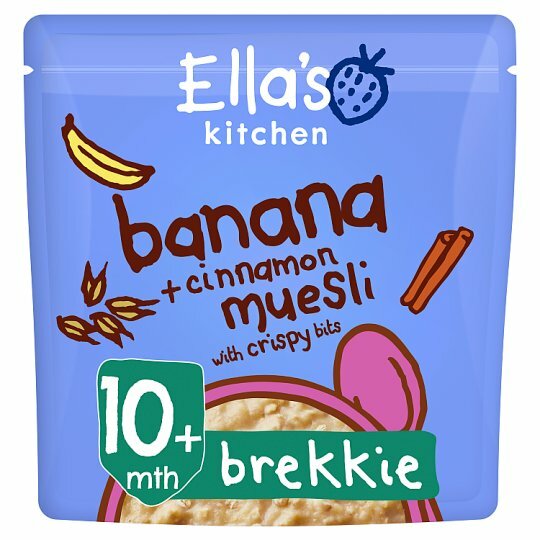 Hello, an organic scrummy oats, maize, banana + cinnamon muesli with wheat crispy bits. I'm a deeelicious start to the day for tiny tummies. Who am I for? My ingredients and textures are suitable for babies from 10 months. I'm chunky + lumpy and my oaty pieces and yummy crispy bits are designed to help little ones learn to chew. My Dad promised me and my brother Paddy that he would only use stuff in our products that is full of goodness. I told him everything also has to taste great and he agreed! Store me in a cool, dark place., I'm best used within 28 days of opening me. Using me: In a bowl, mix 2 dessert spoons of muesli with 56ml of your baby's usual warmed milk. This is just a guide, add more milk or baby rice if your baby likes a different consistency or is feeling hungrier. Always test my temperature before feeding me to your baby.